Continuing a 47-year tradition created by Walt Disney himself, Walt Disney World Resort has selected two Cast Members to serve in the revered and sought-after role of Ambassadors. In a ceremony held today at Epcot, Tye Arnold and Rich Tamayo received their official ambassador pins as part of the announcement, which was greeted with a burst of confetti and the applause of friends, family and Cast Members. 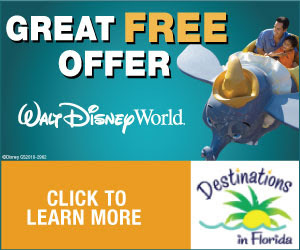 The pair will represent more than 64,000 Cast Members as they share the magic of Disney throughout the resort and the Central Florida community from Jan. 1, 2013 – Dec. 31, 2014. When Tye Arnold sent a letter to the Disney Channel from his small Northeast Arkansas hometown to ask how he could become a Cast Member, he never imagined the variety of roles he would play at Walt Disney World Resort. After interning with the Disney College Program in Magic Kingdom, he worked in various host, tour and Cast leader roles at several of the resort’s parks. 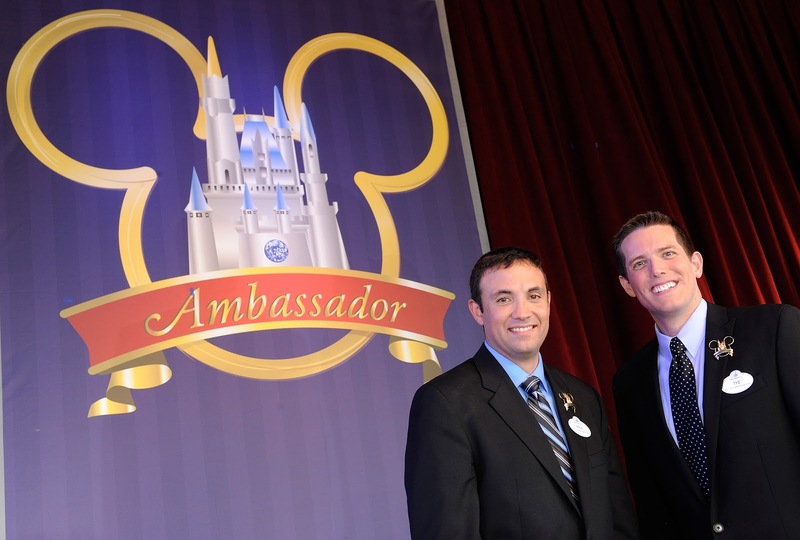 Chosen as a Dream Squad Specialist during “The Year of a Million Dreams,” Tye has helped create magical moments for Guests as part of the Guest Relations team and as year-end leader for Magic Kingdom’s Dream Squad. A native of Queens, N.Y., Rich Tamayo has transformed his passion for sports into a successful Disney career. After starting out as an event service assistant at ESPN Wide World of Sports Complex, he’s held a variety of roles in the company’s sports and recreation sphere – from working with the Atlanta Braves during spring training to ensuring guest satisfaction at various Disney resorts in Central Florida and Hilton Head, S.C. Most recently, Rich continued building his hospitality skills by joining the front office team at Disney’s Boardwalk Resort. Today’s ceremony was the culmination of an intensive, two-month search for candidates who demonstrate a commitment to fellow Cast Members and the community, an understanding of the company’s heritage and, above all, Disney passion. Each year, thousands of Cast Members are invited to participate in the Ambassador selection process, which includes several rounds of interviews and, for the finalists, an opportunity to interact with Cast, visit non-profit organizations and test their presentation and media interview skills. Following a two-month training, the new Ambassadors will begin their busy two-year term. 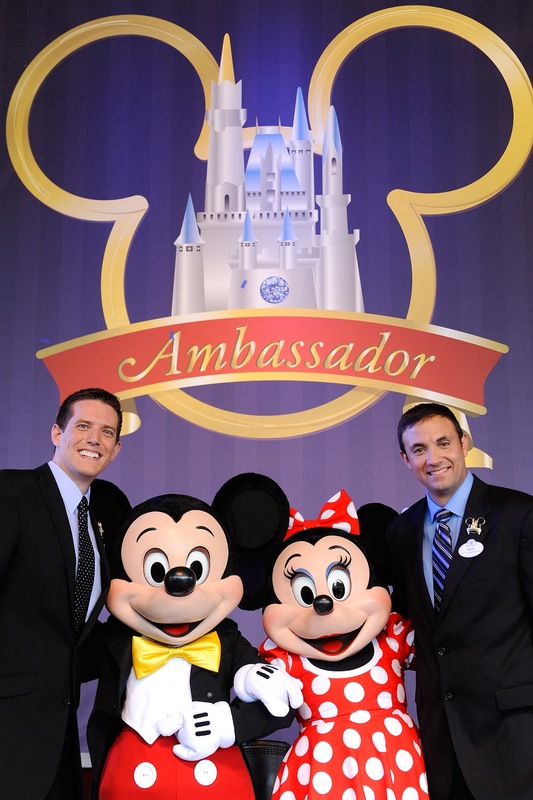 With more than 3,500 events to attend throughout the year, the Ambassadors will be responsible for duties such as hosting Disney VoluntEAR events, making appearances with Disney characters at community presentations, serving as master of ceremonies at park events and recognizing Cast Members’ milestones and achievements. The Disney Ambassador tradition began during the 10th anniversary of Disneyland when Walt Disney was overwhelmed with requests for appearances and media interviews. The program has continued since he chose the first Disney Ambassador to represent the company, as well as its Cast Members and ideals, in 1964.